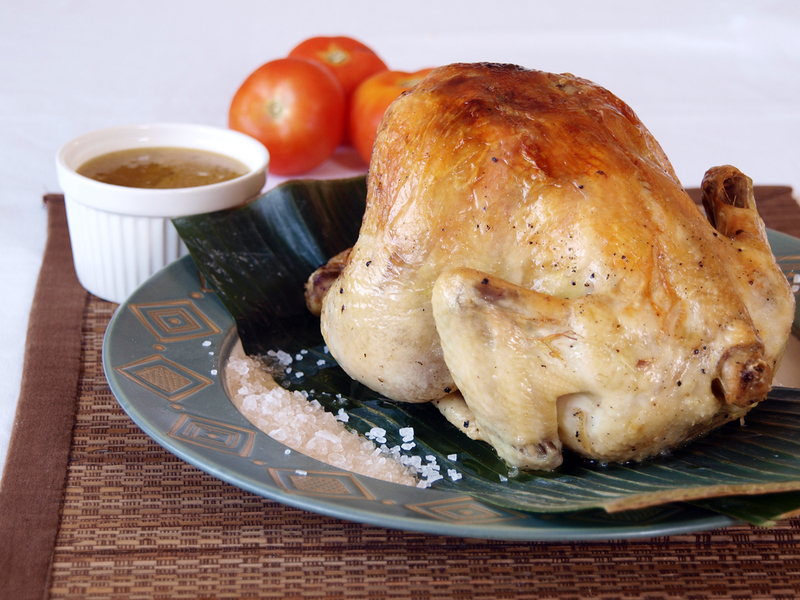 Pinaupong manok is a chicken dish dry cooked in a palayok (earthenware pot) set on a sitting position placed on a bed of rock salt lined with banana leaf. This process makes the pot acts like and oven and cooks the chicken using its own juices, the salt in the bottom prevents the chicken from burning while the banana leaf gives it a different aroma. This was the most common way of baking chicken in the Philippines during the early days when gas ovens was not yet invented. A really simple way of preparing chicken as traditional recipes only calls for chicken, salt, lemon grass and lots of patience as cooking this dish would take at least an hour per kilo of chicken. For this post I will be making some slight revisions to the traditional recipe hence I will be adding onions, spring onions, ginger, garlic and pepper to give it more flavour. Generously rub chicken with salt, garlic and freshly ground black pepper inside the cavity and outside. Stuff the cavity with onions, lemon grass, garlic and ginger. Place 3 cups of rock salt in the bottom of an earthenware pot then line the top with banana leaves. Place chicken in a sitting position then place in an open flame over stove or fire burner, make sure the rest of the chicken would not touch the sides of the pot. Cook for 2 to 2½ two hours or until chicken is tender. Once cooked, place chicken in a wire rack to cool, let the juices run in a container. Place all sauce ingredients together in a sauce pan and simmer in low heat for 5 minutes. Place chicken in a serving plate then serve with dipping sauce. What a great way to roast a chicken and the dipping sauce sounds heavenly. The skin is white in color, just like steamed chicken but yummy, for the sauce try also cooking oil with fresh finely minced garlic, a pinch of salt and soy sauce put small amount of msg if desired. What an interesting way to prepare chicken! Stuffing it with the onions, lemon grass, garlic and ginger sounds so delicious! Love roasted chicken and the dipping sauce sounds wonderful! Pandan leaves is also a great substitute, you might have luck finding either in Asian shops under the frozen section as I saw mine from there. That looks amazing and is going in my to-make file. Love the dipping sauce: just that tad different! What a gorgeous baked chicken! It looks perfect with the crispy skin. Bet it’s really, really moist inside! I’ve never baked a chicken in an earthware pot, and it looks like a real winner! Yum, sounds so aromatic! I love roasted chicken, and I’d love to try it with the banana leaf. Your chicken is so pretty – love that you kicked up the flavor with garlic and ginger. Plus that dipping sauce sounds divine. I can just imagine all the wonderful flavours that have permeated into the chicken meat. i love, love, love chicken…another one for my family…thank you for sharing your recipe with us. God bless you more! This reminds me of my childhood… my dad often cooked this on weekends. Now it’s my turn to cook it for my kids. Thanks for this recipe. I followed exactly the procedure well and its taste great, chicken is tender, juicy expecially the lemon grass aroma of banana leaves its like my Father’s recipe cooked in wooden stove. Any suggestions where to find rock salt? After a year of inquiring at different grocery stores and department stores in Baltimore and not finding it, I finally ordered it online to pick up at Ace Hardware – Ice Cream Salt – but it was about US$5.00 for only 4 lbs. That expense really increases the cost of this recipe. Where are USA readers finding rock salt (or are you using coarse Kosher salt or something else)? Also, is it OK to use a stainless steel pot or is earthenware required and why? Also stainless steel is OK but earthenware being porous heat and moisture circulate through the pot during cooking, unlike with metal or enamel-lined pots. You can see this effect in cookwares like tagines. Also the alkaine content of the earthenware interact with acidity in the food in effect neutralizing the pH balance. In other words it will add some natural sweetness.